Ed Vulliamy, a reporter for the Observer and the Guardian, is the author of Amexica: War Along the Borderline. In 2004 he was shortlisted for an Amnesty International Media Award for his reporting from Ciudad Juárez. 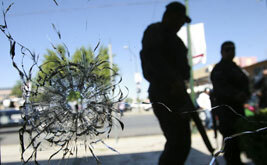 The killing in Juárez bears less resemblance to warfare between cartels than to criminal anarchy.